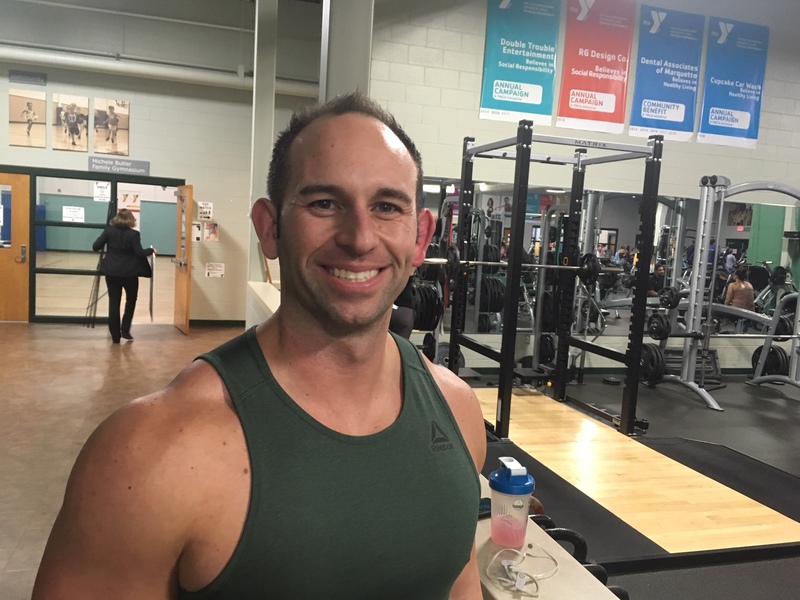 Brian Cabell sits down and talks to the popular and relentlessly positive Travis Alexander, the YMCA’s director of personal training and fitness. BC: Where were you born and raised? TA: I was born in northern Illinois but raised in Mercer, Wisconsin. We moved up there when I was about four years old. TA: It was good. There were six of us–four sisters and a brother, and myself. My mom raised us. It was just her. My dad left when I was about twelve. He just kind of took off and my mom was a rock. We’re a strong-knit family. My sisters and I are super close, my brother, as well. BC: What did your mom do for work? TA: She owned her own medical supplies company. She went from not having a college education…just a GED…then became an orthodontist’s assistant, worked her way up, then went on and opened up her own business. BC: Your dad. What happened to him? TA: He left, got divorced. There were years leading up to it, and when the divorce went down, he obviously just felt it was better to leave. My youngest siblings, they were only four and two at the time. But we got a lot of strength from my mom. I give it up to her for keeping us all together. She’s an amazing person. BC: So your dad just left the family. How’d that affect you? TA: My sister’s husband really stepped up and helped. He became a father figure for me. But I had to step up from being a twelve-year-old boy to becoming kind of a father figure to my younger siblings. I took over that role. I was always trying to educate and teach. Now I’m trying to be more like a brother again. BC: You sound like you were a very responsible kid. TA: Oh yeah, very responsible. I did as much as I could to help out, taking care of my siblings. I always had a job trying to help out my mom a little bit. I always loved to work. I had a full-time job at twelve, bussing tables, washing dishes. And then I got a job landscaping and I think all the way through high school, I had jobs, always working. BC: Where’d you get that work ethic from? TA: My mom. She and the whole side of her family are really hard workers. And they don’t complain. They’re not worried about putting in the extra hour. Same with me. I’m always around here (the YMCA). I love working. When I was young, I wanted to grow up and do something I loved. But I’ve always wanted to work long hours and help people. So I was fortunate to find this path that led to my career. BC: When you were a teenager, did you have any idea that you might become a trainer? TA: Actually, I wanted to become a civil engineer. My grandfather, my uncle, my cousins, they were all civil engineers, so I went to Michigan Tech to become a civil engineer, and quickly found out that was not the route for me (he laughs). But I loved physics and chemistry and all that, so I started looking at sports science. I was really active and I loved sports, so I started thinking about physical therapy. And then I saw that the USOEC had transferred to Northern. That got me interested, but I was really more interested in everyday people who wanted help and guidance in their workouts. BC: Did you play sports when you were younger, even with all your jobs? TA: Yep, I ran cross country and track, I played basketball and golf. We were always the underdogs because initially we weren’t a big school. My freshman year in basketball, we started three freshmen and two juniors so the teams would beat us a hundred-something to thirty. We were the laughing stock but then we grew up and got better. BC: So you started at Tech, then transferred to Northern. TA: Yep, I graduated Northern in sports science. Then I was intrigued. I wanted to go to PT school. I was going to be a physical therapist, I did a lot of observation hours. But then I got a job at Motions when I was twenty, when I was still going to school. I was working forty hours a week as a trainer. And so when I graduated, I became a full-time trainer. BC: What is it about training that appeals to you? TA: I love it. There’s a certain amount of instant gratification seeing someone come in and finding themselves able to do moves they never thought they could do. It’s empowering to motivate people and show them what their body is capable of. It’s more than just a workout–you’re talking to people about their lives, about what things are challenging them. Could be nutrition or the environment they’re in. It’s much more than just training. It’s taking people and having success with them. They want success, they want the answers. They might read about it, but no one keeps their feet to the fire and holds them accountable. So that’s where I come in, meeting them where they’re at, motivating them, reassuring them, teaching them that they can really do these things. And the great thing is they get to work out and sweat. TA: Yeah, I train kids as well as folks well into their eighties. BC: Is there a challenge with kids? TA: Obviously keeping their attention span, and you’re trying to keep it fun. You don’t want to talk to them necessarily about nutrition but you do try to motivate them to choose the healthy foods. Choose the fruits and vegetables. BC: And your older clients present other problems. BC: Do you have a single, most gratifying client over the last five-ten years that comes to mind? TA: This lady came in and she was battling just tons of issues–inflammatories, pain. Couldn’t work out. Sitting down or just walking was an effort. 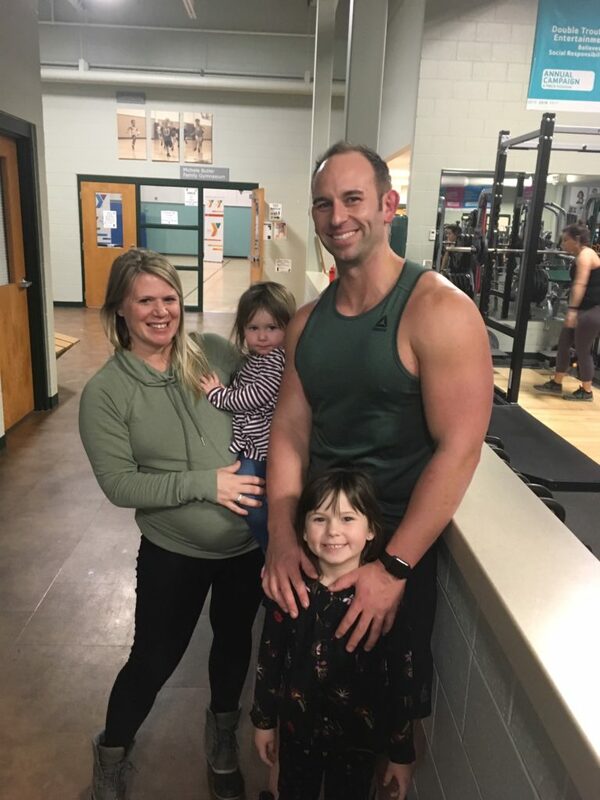 We were about four weeks into it when she came in, and for the first time she was smiling–that was awesome–and she was able to complete the entire workout, and she had tears in her eyes. 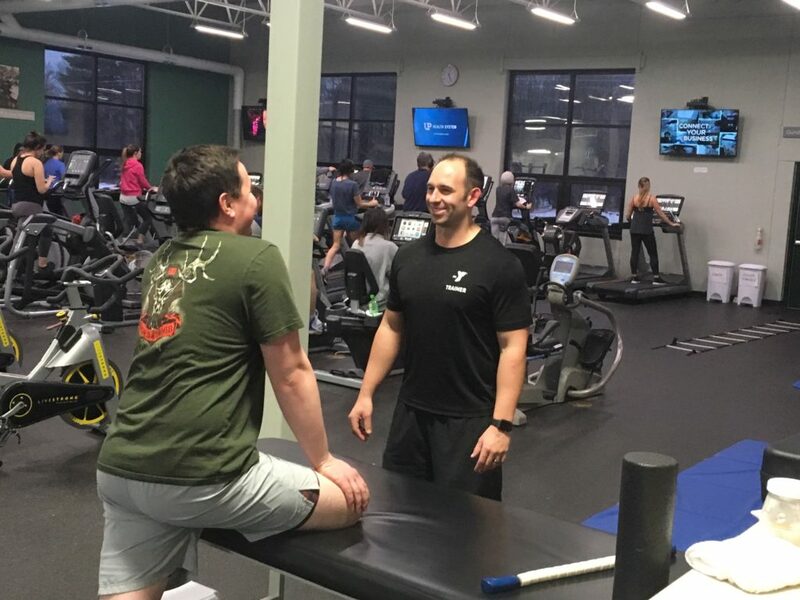 I said, “Are you okay?” and she said, “For the first time, I actually wanted to be here today, and for the first time I was actually able to do a whole workout. And I don’t hurt anymore and now I have hope.” She was in her late sixties, just retired, and suddenly this next chapter in her life with travel and being with her grandkids was opening up. And now four years later, she’s still doing great. She’s living again. BC: Let’s talk more generally. Are we Americans fat and out–of-shape? TA: I never say the word “fat” but yeah, in our civilization, many of us seem to be in the overweight or obese category. Fortunately, we’re starting to have more programs and people are starting to become more active. But yeah, we need to be on the health conscious train. At the YMCA, we have all these youth programs. That’s where it’s got to change. BC: What’s the biggest misconception that people have about physical fitness and nutrition? TA: The biggest misconception they have is that they just have to exercise more. “I gotta lose weight so I’m gonna exercise more.” That’s fine if the exercise helps motivate you, but when you get down to it, it’s 80% nutrition and 20% exercise. Don’t get me wrong–exercise will make you feel better, it’ll reduce the risk of disease, but too many people put the cart before the horse when it comes to losing weight and getting in shape. Exercise alone does not solve everything. BC: So in terms of nutrition, what’s the secret? TA: It’s a matter of understanding how many calories you truly need every day, and the types of food you’re eating–whole foods or processed foods. There’s all sorts of diets out there these days–Keto, Atkins, whatever. I just say, balance it across the board. BC: Travis, when we see you training folks at the YMCA, you look like you truly enjoy what you’re doing. The social part of it. Always a smile, always talking. TA: One hundred percent. Ever since I was a kid, I could talk to anyone. We’d go snowmobiling and we’d go to a bar and I’d start talking to somebody, anybody. It’s something I’ve been good at. I like people, I love people. They’re interesting. I want to know about them and see what they have going on. BC: Let’s get a little more personal. Where’d you meet your wife Melodie? TA: I met her here at an NMU college get-together. She was a freshman, I was a sophomore, and I asked her if she wanted to be my girlfriend for the night–Oh, you probably shouldn’t put that on there!–but she said “Yes” and now look at us 11-12 years later! Almost three kids (one is due at the beginning of February). BC: What was it about her that attracted you? TA: She was real. She told me how it was. She’s a strong, independent girl, and she can talk, she smiles, and she’s my balance because I like to go a hundred miles an hour and she’s more stable and keeps me in line. And not only is she a great wife but an amazing mother who makes me happy every day when I come home. Life is good. BC: Do you recall how you asked her to marry you? TA: Yeah, we did it at the Ambassador in Houghton. We had all these people coming in, they all knew it was going down. I had told them I was going to propose to Mel today but she had no clue. So I kept it from her for a whole week. But in the week leading up to it, I was talking in my sleep and I said something about a ring. She woke me up and said, “What are you talking about with this ring?” and I was, like, “Oh, I was just dreaming about a cracker jack box!” ( we laugh) And I totally tried to cover it up. So on that Saturday in Houghton all these people start showing up and we ask them why and they say “Oh, we’re just in Houghton for the day.” And so we’re finishing up dinner and all of the sudden, here comes an ice cream sundae with a cracker jack box in front of it, and the ring was behind it. I managed to cover it up pretty well and then it all came together. BC: So you’ve got two daughters now, and another baby on the way. What is it about kids that you love? TA: The energy. Never underestimate the power of a child. I thought I knew kids, and then you have them and they are amazing–at what they remember, at what they do. The greatest part of their day is when they get to hang out with you, so when I come home, it’s the highlight of my day, and it takes a little pressure off of Mom. BC: What’s your favorite thing to do with them? TA: You know what? Be outside. Mallory (his 5 year old) likes to help me in the garage but we love to hike, we love to go sledding–we were out there sledding last Sunday for about two hours. It’s something so simple but it’s really so much fun. BC: What do you do when you’re not working and you’re not with your family? TA: I like to snowmobile. It’s a nice way to get out and just decompress. I like to run. Sometimes on a Sunday morning I can just go out and unplug and enjoy it. I dabble in woodworking and I want to get more into it. It’s something that tests my patience because normally I’m so fast, but it’s something that takes time and effort. BC: Now, not too long ago, you got some media attention because you were involved with helping two heart attack victims at the Y. What exactly happened? TA: Both scenarios involved people coming in to exercise. They were exercising on some cardio equipment, and fortunately I was in the right place at the right time. The first heart attack, the guy was only about fifteen feet away from me when he fell off the bike. Fortunately I was able to perform CPR on him right there and then we used the AD (Automated External Defibrillator) machine. He came back pretty quickly. And the paramedics were here within four or five minutes and they plugged in and injected him with epinephrine, and allowed his heart rate to stabilize. The second heart attack, I was at the front of the building, and the man goes down on the treadmill, so everybody starts yelling my name. “Travis, someone went down!” One member had already started CPR on him and then I jumped in and continued CPR until the paramedics got here. And again we used the AD. It all just comes down to training. In the heat of the moment, it becomes real and you just gotta keep your cool. BC: Did you have any previous experience? Had you seen heart attacks before? TA: Yeah, my mom had a pacemaker put in and she was starting to have some health issues. I was at Tech at the time and I came home for a break, and we sitting there and then, Boom, she just toppled over. Heart stopped, nineteen seconds, so she should have passed but fortunately her heart kicked back in. BC: Did you give her CPR? TA: No, because I didn’t know it at that time. I didn’t know what to do. I was eighteen years old at the time. I hate being helpless. If I don’t know something, I’m going to find out the answer. So from that moment forward, I was going to be CPR/AD certified. BC: So what’s in your future? You’ve got a great family, you’ve a got a great job. TA: You know, at the YMCA I can give back more to the community. And why not educate the entire Marquette area, the UP? I mean, you’re on TV6. You can educate, you give motivation. What better place for that than at the YMCA? It’s a community facility and you’re part of a family. BC: You seem to have a pretty damn good life–a young, healthy guy with a pretty, healthy, smart wife, two gorgeous kids, another one on the way, a nice, high profile job in a place you want to be. Do you ever wonder why so many good things happen to you? TA: I have a lot of faith. That’s a big part of our family. My grandfather would always talk to me about karma. He’d say, “Travis, if you’re going to do something, karma’s gonna come around and hit you, so don’t do anything bad. Be good to people.” So my whole life, I’ve tried to be good to people, and I believe they’ll be good to me. And yes, we live in the real world and it doesn’t always work that way, but I’ve been at it now for 31 years now, and it seems to be working. I seem to be doing okay.